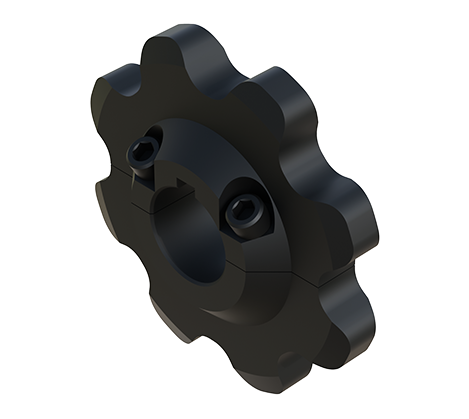 Black Ace Agricultural Roller Chain Sprockets are manufactured with the highest integrity. You will realize value, as these sprockets are flame-cut and machined with the highest precision available on the market. ANSI Standard Torch Profiles – Engineered to promote the best life of your sprockets and chain. B Type (hub on one side) used in applications where clearance width is narrow. Typically have two (2) setscrews on the hub to fasten the sprocket to shaft and keyway. Split Style Narrow Width – Enjoy the benefits of split style construction and keep the total sprocket width only slightly wider than the sprocket tooth thickness. Hex Bore Split Style – Used in equipment that uses hexagon shafts. Idler Style – Assembled with a long-lasting Black Ace Ball Bearing.